Order received before May 21 will be delivered beginning late April to the end of May. After that date ( May 21 ), order will be delivered in September to mid-October. Our family farm is located in St-Lambert-de-Lauzon in the Quebec City area. We are listed in zone 4 b. We specialize in cultivating irises and lilies. We sell our products through the Internet,. All our plants are perennial and can therefore remained in the ground for the winter. We are in operation for more than 20 years. All our plants are grown in the field. 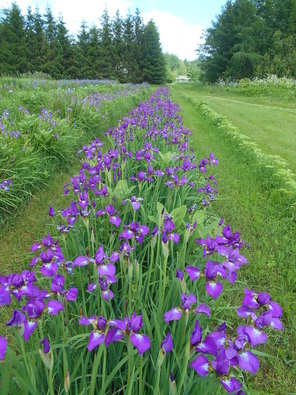 We harvest our irises and lilies in late April for delivery of your orders in May. We do the same with the harvest in late August for delivery in September. All our products can be planted either in the spring or in autumn. Because we grow our plants in the field, we can offer iris rhizomes and lily bulbs whose freshness helps to improve quality. In addition, we strive for you to select cultivars that are distinguished by their bright colours and exceptional beauty.